Ethiopia is denying claims that it forced through its controversial Gibe Dams Project without consulting its neighbour Kenya. In a statement on Friday, Ethiopian Ambassador to Kenya Dina Mufti said his country has always discussed the matter with Nairobi and they even have a team of officials from both sides that deals with possible environmental problems from the project. “This is a baseless allegations concocted against the Gibe project that the Ethiopian government is undertaking for only generation of hydropower. Ethiopia and Kenya have Joint mechanisms called Joint Ministerial Commission (JMC) and Joint Border,” he said. “The two countries have been in regular consultations regarding the Gibe project from its inception and have been determined to resolve any concern through cooperation. “It is under the above mentioned mechanisms that the two countries have been working together to protect the common natural resource of Lake Turkana,” he said. Addis Ababa, which has been building dams along the Omo River, has recently come under fire from rights and environmental groups, which accuse the country of forcing through the projects without considering their environmental impact. On Tuesday, Human Rights Watch (HRW) said Lake Turkana, which receives its water from the Omo River, is slowly drying up. Based on publicly available data from the United States Department of Agriculture, the group said, Lake Turkana’s water levels have dropped by approximately 1.5 metres since January 2015, and further reduction is likely without urgent efforts to mitigate the impact of Ethiopia’s actions. Human Rights Watch said it investigated the impact based on satellite imagery that shows that the drop is already affecting the shoreline of the lake, which has receded by as much as 1.7 kilometres in Ferguson Gulf since November 2014. 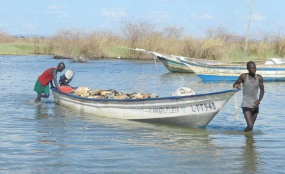 The gulf is a critical fish breeding area, and a key fishing ground for the indigenous Turkana people. “The Ethiopian government has shown scant regard for the lives and livelihoods of already marginalised communities who are reliant on the Omo River and Lake Turkana for their livelihoods,” said Felix Horne, the head of Arica Research at HRW. The latest controversial project is the Gibe II dam, set to cost $1.8 billion and which could produce 1,870 megawatts of power when completed. This will make it the third largest dam by power production in Africa. But rights groups say the dam is holding up water that previously flowed unimpeded into Lake Turkana and replenished seasonal drops in lake levels. In 2015 the annual July-November flood from the Omo River into Lake Turkana did not occur, resulting in a drop of water levels of 1.3 metres from November 2014, HRW says. But Ethiopia says the fact that the flooding did not occur is beneficial to people who had had to flee every time the flooding season came. Mr Mufti dismissed HRW as one of the groups bent on spoiling development projects for African nations by citing baseless rights abuses. Kenya Environment Cabinet Secretary Judy Wakhungu admitted the existence between Addis and Nairobi but raised concerns over the risk of water pollution. “There is an agreement with Ethiopia, but there is also a general agreement based on international law, that whenever there transboundary resources both countries should agree on the use of resources and the development of those transboundary resources should not negatively affect the other country.